Amazon Best of the Month, May 2009: Like his fellow New Yorker Jonathan Lethem, Colson Whitehead weaves gracefully through genres with each of his books, but Sag Harbor, billed as his "autobiographical fourth novel," seems positioned to be his breakout book--which is a funny thing for a writer who has already received so many major literary awards, including a MacArthur "Genius" grant and being short-listed for the Pulitzer. The year is 1985 and 15-year-old Benji Cooper, one of the only black students at his elite Manhattan private school, leaves the city to spend three largely unsupervised months living with his younger brother Reggie in an enclave of Long Island's Sag Harbor, the summer home to many African American urban professionals. Benji's a Converse-wearing, Smiths-loving, Dungeons & Dragons-playing nerd whose favorite Star Wars character is the hapless bounty hunter Greedo (rather than the double-crossing Lando Calrissian). But Sag Harbor is a coming-of-age novel whose plot side-steps life-changing events writ large. The book's leisurely eight chapters mostly concern Benji's first kiss, the removal of braces, BB gun battles, slinging insults (largely unprintable "grammatical acrobatics") with his friends, and working his first summer job. And Whitehead crafts a wonderful set piece describing Benji's days at Jonni Waffle Ice Cream, where he is shrouded in "waffle musk" and a dirty T-shirt that's "soiled, covered with batter and befudged from a sundae mishap." 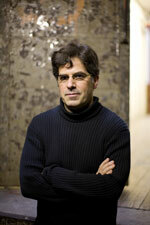 Jonathan Lethem's new novel, Chronic City, will be published in October 2009, and is his first to be set in Manhattan. He is the author of seven novels including the New York Times bestseller The Fortress of Solitude, which was also a New York Times Book Review Editors Choice for 2003, and Motherless Brooklyn, which won the National Book Critics Circle Award in 1999. A recipient of a MacArthur Fellowship, his stories and essays have appeared in The New Yorker, Harper's, Rolling Stone, Esquire, and the New York Times among others. He lives in Brooklyn, New York, and Maine. First, an immodest disclaimer: I knew Colson Whitehead was really, really good before you did. That's because we share a publisher, and an editor, and I was sent a copy of his first novel, The Intuitionist, and asked to give advance comment--"a pufferoon," as insiders affectionately call the things--which I gladly did. In fact, I not only admired The Intuitionist, but it was a book that made me immediately feel less lonely. I'd published four novels at that point, and Colson's helped me to feel my particular approach, the sorts of things I was trying to pull off in my novels, wasn't absolutely misconceived. In fact, I wanted to hitch my wagon to Colson's obvious rising star; his first novel was more flawless, more accomplished, than my own first--it might have been more accomplished than my fourth, I wasn't sure. I immediately sought Colson out as a friend, and he's been one of my own most crucial peers ever since. Set over the summer of 1985, Sag Harbor, the fourth book from award-winning writer Colson Whitehead, is steeped in 1980s pop culture. Music plays a vital role in the novel, and in this exclusive annotated playlist Whitehead compiles a lineup of nine essential tracks of the early MTV era, including highlights from The Smiths, Run DMC, Bauhaus, and Doug E Fresh and Slick Rick. And read our interview with Colson Whitehead as we talk about Sag Harbor and discuss some pop culture hits and misses from the 1980s, grilling tips, McFadden & Whitehead, 12-sided die, and the allure of Twitter.